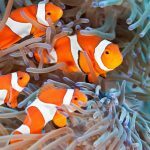 Choosing the best nano saltwater fish for your nano tank might be one of the few times in your life that you’ll be glad to be facing tough decisions. They’re all so beautiful that you’ll probably want them all. We feel the same way. 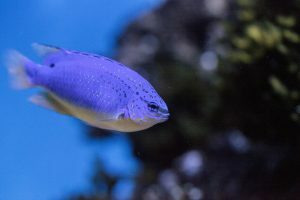 But first, if you’re new to owning an aquarium, you’ll need to start with some pointers about how to choose the best saltwater fish for your tank. 1. 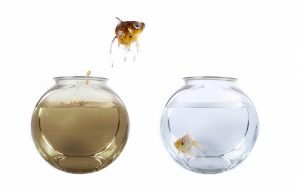 You should choose fish that will stay small to fit their living space. 2. The best nano saltwater fish for your nano tank will get along with other fish, but are tough enough to last. 3. The fish should be able to eat common foods and adapt to their environment. 4. 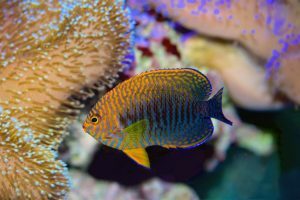 Overall, your aquarium should be harmonious in terms of the types of fish that are in there, the plants, the gravel and coral, and any other features. Once you know a little more about their temperaments and traits, you’ll need to narrow down specifically the best nano saltwater fish for your nano tank. Saltwater fish enthusiasts have their favorites, so you might want to take their advice with a grain of salt and go with your gut. Nevertheless, here are some of our favorites to give you some ideas. “Finding Nemo!” … Or “Finding Dory,” if you prefer. Either way, these fish became especially popular after the release of the first of these two beloved full-length cartoons. And we can see why. Clownfish are very fun … and also kind of funny, as the name implies! Goby in general are high on many people’s lists regarding the best nano saltwater fish for your nano tank. We like the Coral Goby, Neon Goby or Yellow Clown Goby because they are bright and fluorescent, adding fun and liveliness to your tank. When they’re on top of their game, you won’t see any damsels in distress here. Damselfish are very territorial and defend their food and reproductive sites from intruders. You do want fish to be strong, as it will help them to live longer lives. Plus, these fish are just too pretty to pass up. This fish is not quite as eye-catching as the others. But as we learned from Rudolph, every creature has its place. 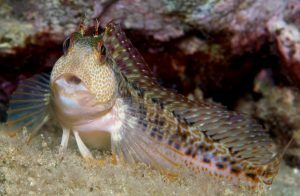 The Blenny is among several types of algae eaters that will assist in keeping your aquarium clean, helping the filters work as well as possible. Other aquatic animals that can help keep your tank clean include snails and certain types of crabs. The possibilities are endless regarding the inhabitants of your aquarium. Because factors including the size of the tank and the time it takes to care for the fish could make a difference in the best nano saltwater fish for your nano tank, let us help you decide. We can be reached through our Seatech Aquariums website or by phone at 602-628-7270. We’ll look forward to showing you how exotic and exciting your aquarium can be! 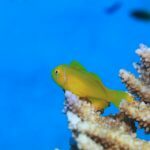 This entry was posted in Fish Facts, Saltwater Aquariums and tagged Blenny, Blue Devil Damselfish, Cherubfish, Chromis, Clownfish, Goby, Nano Tank, Pygmy Angelfish, saltwater fish on July 22, 2017 by admin. You want to give your fish a good home and a long, healthy life, and that’s why you need to have a clean tank for them to live in. 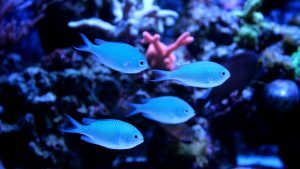 If you’re thinking about starting an aquarium, you need to know the basic types of aquarium filtration for a healthy tank, as not all filtration systems are ideal for every tank. Before we get into the basic types of aquarium filtration for a healthy tank, you need to understand the three categories of filtration: mechanical, chemical and biological. • Mechanical: Mechanical filtration is the process in which particulate matter is removed from the water. • Chemical: Chemical filtration removes toxic or unwanted chemicals as the water passes through a chemical media or resin. • Biological: In biological filtration, different types of bacteria convert the toxic chemical byproducts produced by the aquarium inhabitants into less toxic nutrients. This breakdown process by the bacteria is called the Nitrogen Cycle. If you’re wondering why filters are necessary at all, think of them as the things that make the tank comfortable for fish. In addition, fish would not be able to survive in an unhealthy, dirty environment, so a filter helps to prolong their lifespan. In other words, materials that would dissolve in or at least not saturate a natural body of water accumulate quickly in an enclosed aquarium system. Filters help to create a healthy environment in an aquarium. The type of filtration you use will depend on the size of your aquarium and the number of fish that will be in it. You may need to use a combination of filters as well. Following are some of the basic types of aquarium filtration for a healthy tank, as described by sources including Doctors Foster and Smith. 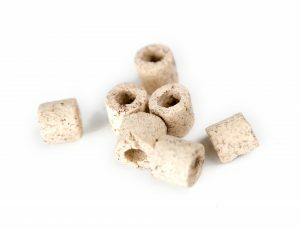 Air-driven internal filters are small, box-like or foam filters ideal for hospital aquariums and aquariums with very small fish. These filters are placed inside the aquarium. Protein skimmers remove waste products from wildlife in the aquarium before they break down. As a result, protein skimming helps to reduce nitrate buildup and algae growth and improves water quality, which allows other filtering systems in the tank to function more efficiently. Protein skimmers work by creating air bubbles in a reaction chamber. They are most ideal for reef tanks. These filters are placed underneath a layer of aquarium gravel and move water through the gravel for biological filtration. They require either an air pump or powerhead. Primarily, they are biological filters, but many can be modified for chemical or mechanical filtration. They can be used for small or large aquariums, but they are best suited for a light fish load. Internal power filters are placed near the bottom of the aquarium, so waste is removed before it has a chance to settle on the bottom. They are made for smaller aquariums. Perhaps the most widely used filters, power filters provide biological, chemical and mechanical filtration. They hang off the back of an aquarium and are ideal for most aquarium sizes. Canister filters provide all three types of filtration and are for larger aquariums or aquariums with a lot of fish. The canister filters will have a few large media baskets to hold different filter media types. Their main appeal is that since this is a pressure system, all of the water is forced to flow through all of the media. However, canister filters require a little more effort to set up and maintain than other types of filters. They are ideal for cichlid aquariums, saltwater aquariums and freshwater planted aquariums. The main difference between canister filters and power filters is the amount of water they are able to easily pump and filter within an hour. Generally, the canister filter is gentler while the power filter is stronger. 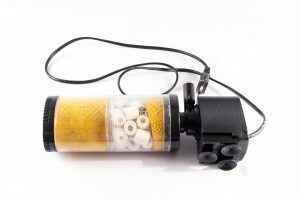 A canister filter (specifically the canister portion) may be larger than most power filters. Wet/dry filters are the most powerful in terms of biological filtration. They are especially ideal for saltwater fish-only aquariums. The filters are installed in a way that the media is exposed to both water and air, hence the name. These filters, however, require the most work to install. They can be placed under an aquarium and require an overflow box on the back. Now that you know more about the basic types of aquarium filtration for a healthy tank, you need to decide which filter is best for your aquarium. Let us help you narrow down your options in order to select the most ideal filter. We can be reached through our Seatech Aquariums website or by phone at 602-628-7270. 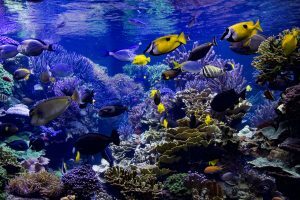 This entry was posted in Aquarium Maintenance, Water Quality for Fish and tagged Aquarium Filters, Fish Tank Maintenance on July 16, 2017 by admin.